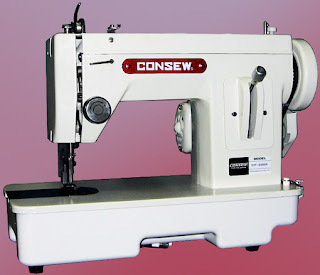 I've been in the market for an industrial sewing machine for a while now, and I was willing to consider any strong machine at a reasonable price under $100. I sew a lot of denim and I've learned to squeeze out every last bit of power from my vintage sewing machine pool. The problem is that I spend a lot of time walking the needle by hand instead of having the machine do the work for me. There are two main options when it comes to industrial machines, the portable all enclosed models or the kind mounted to the table with huge motor underneath. I was willing to take either one and most likely would choose portable over huge motor and table setup. No matter which way you go when you start looking at industrial machines things get expensive fast. The table mounted machines are designed to be used at high speeds for long periods of time. The large motor spins at full speed all the time allowing you to engage the sewing machine (head) by way of a clutch pedal. This setup works amazing well since you have access to the full momentum and power of the motor at any time. Table mounted machines are usually big on power but lacking in the feature department often being designed for one specific task instead of all around sewing. Things we take for granted like zigzag and reverse are not always included. Depending on your motor and table setup they might require a 240 volt outlet or even three phase power, neither which you'll likely have in your sewing room. Portable industrial machines are much like an all metal vintage home machine with a more powerful motor. They're designed to be used in high demand situations like dry cleaners or for someone sewing sails. They are not designed to be used constantly like in a garment factory. Since I am sewing jeans this style of machine would most likely work out great for me. I check craigslist a lot for sewing machines and other items. People selling on craigslist don't want to hassle with ebay and shipping. I've found the prices are usually better and the transactions are simple and easy. I usually don't check out of my area but for some reason this past weekend I decided to check what they had just over the border in Florida. Wouldn't you know it there was a posting for three industrial machines someone was selling. Taking county roads way out into the middle of no where I was reminded of just how beautiful and lush it is here in the South. The sewing machines were being sold by an elderly couple who had a dry cleaner business at one time. There was an industrial serger, hemming machine, and what they referred to as the "straight stitch". The machines hadn't been used in at least 7 years and were being stored in something like a uhaul trailer out behind the barn. Humidity in the South is not kind to bare metal and there was plenty of rust distracting me from buying this Pfaff 138. After closer inspection I noticed that what was rusty was easily replaceable things like the tension disks and bobbin case. The actual machine did not have any rust and the motor under the rusty table looked clean as well. Curiously looking around the trailer I noticed at the back this old guy had a HUGE safe, being polite I resisted asking about it allowing my imagination to fill in the blank with bars of gold and old treasury bonds. We struggled to get the machine and table in the back of my SUV and I paid him the asking price of $100! I could tell he knew it was worth much more but was just beyond worrying about such things. Of course since I didn't take the machine off the table the top heavy thing promptly fell over narrowly missing my back window and doing quite a number on the plastic interior. I should have known better, but was so thrilled about the machine I wasn't thinking straight. The machine did not suffer any damage whatsoever which was a relief. For me there is almost no better fun than getting an old sewing machine home for the first time and opening it all up and seeing what it's about. This Pfaff 138 was was dry as a bone! No oil or grease anywhere which means it was very stiff to turn. I use Marvel Mystery Oil as my sewing machine oil and when applied to this dry machine you could actually see the metal wick the oil like a sponge. It was most satisfying to feel it loosen up with each oiling point until it was smooth as silk. "During the Depression, when I was in high school, I worked as a mechanic in a sewing shop in the Garment District in NYC. Those old sewing machines had visible oilers on top, and when it got hot the oil would stink, and the ladies who ran the machines would complain. The owner, whose name was Marvel, (pronounced Mar-VELL) told me to go down a few doors to the candy factory-I think it was a 'LifeSaver' type candy- and get a couple of gallons of Oil of Wintergreen and some food coloring. We mixed it with the 10 wt. sewing machine oil to make it less offensive to the ladies. It became popular with the other shops, and Marvel made more money with that oil, than with the sewing. Whenever anyone asked what was in the oil, Marvel said, 'Don't ask... It's a MYSTERY!' and that's how the name came about!" Works for me! From what I hear it's mostly kerosene anyway which wouldn't you know it can be used as a sewing machine oil and degummer. It does a great job of removing the old yellow oil build up that you get a lot on old machines. You can pick it up at Walmart or any auto parts store, you can put it in your gas tank also however the benefits of such use are debatable. Ok I've gotten off topic here, back to the Pfaff 138. The Pfaff 138 is actually quite an amazing industrial machine and can be picked up used, head only, for around $700 on ebay! Wow that's expensive and seems a bit steep! Part of the reason for this could be the features but I can only speculate here. This machine has reverse, zigzag, and something I was shocked and thrilled to find, needle position (left, center, right). These features make the Pfaff 138 an extremely versatile all around industrial machine. Instead of gathering dust waiting for a specific project, the Pfaff 138 can be used to sew any textile from leather to silk. As an example the machine came with a box of size 60/8 needles, that's for some very delicate and lightweight sewing! The downside to this machine is needing different bobbins, machine feet, and needles than any of my other machines accept. I did find an adapter that would allow me to attach a low shank universal snap on foot adapter so I can use all my guide feet but it costs $45! I know this won't break the bank but just seems so crazy that it's almost half the price I paid for the machine itself. That.... is just the way the world works. I have a little movie and slide show I did for this machine. It's really me practicing with my video editing software disguised as a sewing machine demonstration of sorts. I tried not to make it too cheesy for you. What a steal! Had to watch your demo without sound (at work), but this looks like an awesome machine! Enjoy! It is such an amazing machine! I've only been able to sew a few small projects on it so far but everything I've done has been smooth and easy. It's so quiet! Brian, are you aware of how lucky you have been? Getting a Pfaff 138 at that price? Go back and get the serger, you won't be sorry. Oh, and when you go back, take a nice box of chocolates for that couple. I went back and watched the video, and was overcome by 'massive machine envy'! That satin stitch is to die for. Most machines can handle multiple layers of denim etc. The difficulty seems to lie in the ability to stitch across cross seams or cross felt seams in denims or heavier fabrics. I have a much older version of the Pfaff 138 but mine is a treadle, if you can imagine that. Treadling a massive machine. It walks over denim seams too but I'd really like to motorize it soon. BTW, I am new to your blog, love your videos and I am an 'anything to do with sewing fanatic'. Welcome Gem! Just today I am sewing my first pair of jeans using the Pfaff, it's great! I'm thinking of getting a smaller pulley to give me more control since I really have no need to be sewing fast. Precision is much more desirable! Wow, I need one of those. Hi Brian. I found your site now too! I have a vintage sewing machine manual that recommends you clean a stuck singer with, you got it, kerosene or gasoline. Follow with sewing machine oil. Jealousy rears it's ugly head! I've been wanting an industrial machine like that for a while and decided I couldn't afford one. I can't believe that you picked one up for so little money. Hi, by the way. I'm Paul and new to your site. I was trying to find a little more information on my Singer 500A and got sucked in by your other posts. You mentioned that you were messing around with video editing software when making this video. This happens to be another area of interest to me. If you don't mind me asking (off topic), what software was it and what are your thoughts about it. Can you make a picture of the knee* (don't know the word for it, the unit that lifts the 'foot' by pressing it with your knee). I just purchased a 138-6 but can't figure out how to connect the knee* to the machine's 'footlifter'. I also just purchased a 138, can you provide any ideas for additional presser foot options, were can I purchase them? I've just bought a 138 myself, and I'm wondering if you know a place to buy the foot adapter you talk about #6603 ? Hi brian I was just wandering if you use the marvel oil full time in your machine or if that was for cleaning and restoring. Industrial sewing machines require a very refined and clean oil. 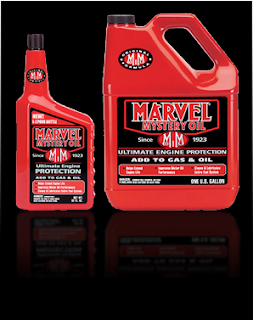 The marvel oil additive looks great for cleaning and getting the machine back to a smooth running order but I would def highly reccomend using a dedicated oil specifically for sewing machines. If you read any old singer manual they always specify in bold at the very beginning to not use any other oil than reccomended. Now I don't agree that it has to be singer oil in that case but an oil that meets the same specs will work fine. Using sewing oil full time after the machine has been thoroughly cleaned will prevent wear on the moving parts. Industrials move at a much greater speed than portables do. And there is no true industrial sewing machine that is portable they are considered commercial. Sorry I just hate seeing all these home machines that advertise as industrial because they have metal gears. A true industrial has all advantages over a portable when it come to a final product. Most poeole will always mention that they sew a lot faster and are heavier duty, but very rarely do they mention that you will be able to sew with a lot thicker thread and that they sew a tighter stitch therefore creating a professional product can be achieved. The seams will be 10x stronger than any portable machines. And I guess you could say theyre at a disadvantage because they are dedicated machines but you really don't need more than straight, zigzag, and a good industrial over lock machine to make a large number of products that will look more professional than anybmachine with 100 stitch options could achieve. They're basically toys with a computer when it come to the "state of the art" home sewing machine that people are being sold into. Marketing is a very evil thing when it comes to sewing. Plastic will never be able to sew like an all hardened metal machine. Them industrial are made for the professionals for a reason they will run for years and can take a lot more abuse than portable machines. Hi,I have a Pfaff 138 and love it.If you open the side panel and loosen the shaft the foot is on it can be lowered to the correct height for 1" feet. I've had my machine for 23 yrs and was only told that about 5 yrs ago. I now have many feet and no adapter needed. Wow, dear Dixane, thank you so much. I was looking everywhere for this 6603 adaptor when i read your comment. I just tried it ans it works just fine. Thanks for sharing ! Hello all, what size needles so you use? Where do you get them? Hi! Was looking for help with timing for my 138. Thought you might enjoy a story about my 138. My mother bought this machine in the early 60's when I was in HS. She did upholstry work on it and made all our school clothes, 2 girls, 3 boys, as well as her own. Years later she bought an electronic home machine, and gave this one to my brother to make seats for restored muscle cars. A few days ago he brought it back to me! It's in awful condition after sitting in his auto repair shop for 10 years. But, the motor is still strong and I'm restoring the old girl to use her to do some cushions. At least I will, when I get the timing right. Although my 138 was bought used, she's been in our family for 53 years! Amazing machine! Watch youtube for pfaff 138 and other sewing machine adjusting /timing video's! Great work and I think i got an even better deal...FREE. My cousin contacted me since I lobe sewing machines if I wanted this one...it was her grandmothers but just going to waste in the shed...OF Course I Do!!! Wile loading it we noticed the little accessory drawer underneath and it had the manual, needs, feet almost everything but only one bobbin. so I will be ordering me some spare bobbins and a new belt as this was was so stiff and brittle. I have not heard it run yet but it amazed me that there was NO rust inside on the gears so I think we may have just saved this machine. Hello! Thanks for your blog. Can you please send info on the $45 adapter you bought that works for your feet? I just got one of these and I am having trouble sourcing feet.